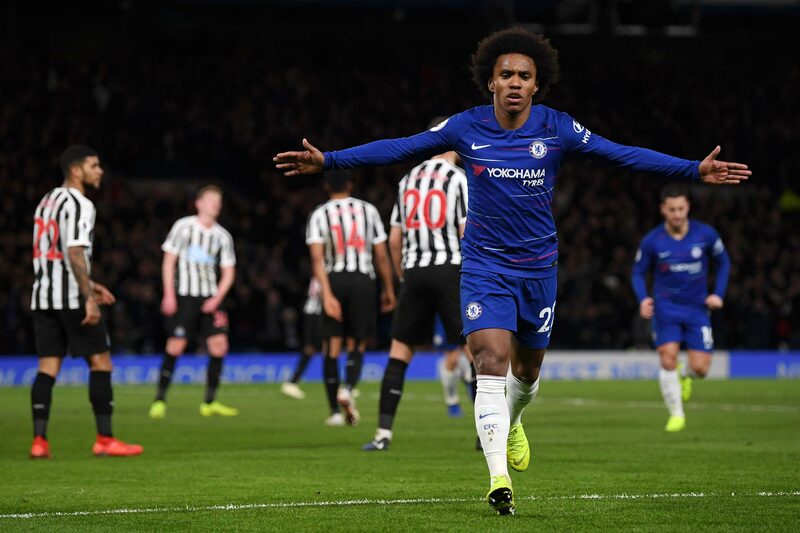 A great Pedro opener and a wonder strike from Willian was enough to dig out three points against a resolute Newcastle side on Saturday evening. It was another home match in which Chelsea struggled to create chances, partly because ball movement and creativity in our patterns of play were at a premium, but also due to Rafa Benitez setting his Newcastle team out in a 5-4-1 formation which was very difficult to get behind. Get behind is what we did in the ninth minute however, as a fantastic ball over the top from Luiz in our own half picked out the out to in run of Pedro who got behind Ciaran Clark. The Spaniards first touch was exquisite, and with his second he lifted the ball over the advancing Dubravaka to give us an early lead. This bright opening was not to reflect the match as a whole though. Although we would dictate possession and therefore the tempo, we found it difficult to create openings. Newcastle on the other hand arguably had the better chances in the first half despite having less of the ball. Solomon Rondon had lashed a shot wide at the near post before they had a great chance to level after some extremely poor defending from Chelsea. A long ball was played up to Rondon, who was challenged by Luiz. Inexplicably Rudiger had not dropped to cover the run behind and had gone to challenge for the same header as Luiz. When Rondon won the header his flick behind left Ayoze Perez clean through down the right of the penalty area but he shot wide at the near post as Azpilicueta came across to cover. The nature of Newcastle’s defensive set up meant that when Chelsea played out from the back Jorginho was the only spare player to play into as Hayden and Longstaff in the visitor’s midfield picked up Kante and Kovacic. When the ball came into Jorginho he looked to play forward either to the left or right into our wingers or overlapping full backs, or into Hazard dropping off from the centre forward position where he was again preferred to Giroud. From here Hazard would attempt to link with Pedro, Willian, or Kovacic and Kante coming forward. The problem was that those receiving the ball from Jorginho took safe options, and they were played back to him, or when link up play was attempted it broke down due to poor pass selection or interceptions from Newcastle. Unfortunately some of the Chelsea fans perceived this to be Jorginho’s fault and got on his back. Perhaps encouraged by the misleading stats banded about in the press lately that he has most passes completed with no assists to his name. The reality of the situation is that he is there to recycle possession to the creative players who then need to make chances. A couple of stats to illustrate that he did his job follow. As outlet for the midfield he completed the most passes, as you would expect. 101 passes compared to the next best of 87 by Azpilicueta. The reason Chelsea struggled to create is underlined by the pass completion percentages. Jorginho played more passes than anyone, and had a 91.1 % pass completion rate. Hazard by comparison who was dropping to link play, had 40 total passes in the match with a 65% completion rate. Newcastle drew level when Ciaran Clark headed in a corner five minutes before half time. Unfortunately Pedro was manning the post at which the header went in, but came off it as the ball was played in. Chelsea had a good chance to retake the lead before the break when Jorginho picked out the run of Willian over the top, but he pulled his shot wide at the near post. It looked like a frustrating second period was ahead as creativity was lacking. Chelsea were out early for the second half and waited on the pitch for the visitors. Usually a sign that the manager wasn’t particularly pleased during the half time team talk. There was an improvement at the start of the half from Chelsea. Kante found Pedro on the right corner of the penalty area, and his shot across goal was well turned round by Dubravka. Alonso got a rare cross in which Pedro received around the penalty area, but he didn’t catch his first time shot cleanly and Dubravka gathered easily. Chelsea retook the lead just before the hour mark with a superb effort by Willian. Hazard had received the ball dropping deep, and executed a fantastic turn, which removed three Newcastle players from the play. He then fed Willian on the left side of the penalty area. He appeared to be waiting for players to arrive in the box before crossing, but then moved the ball onto his right foot and bent it between two defenders and in of the far post. An unstoppable strike, one of our best this season. This goal seemed to restore the confidence in some of our players, and some better link play ensued. There was space between the lines of Newcastle’s defence and midfield there to be exploited, but we seemed unable to make use of it aside from a couple of occasions where Hazard received the ball in there and moved it on quickly, but the attacks came to nothing. Pedro was finding space in this area, but no one was able to pick him out, perhaps again some of the passing was too safe and not incisive enough as we went sideways rather than cutting through the opposition as we have done in the past. This ability seems to have deserted us at home of late. Balls over the top were still getting joy though. Luiz pinged another beauty finding Willian this time, He lifted it over Dubravka, but it was heading wide at the near post after the keeper got a touch on it, Lascelles ensured this has he put it behind for a corner. As time wore on it was the visitors who pressed to level the match. They got a few crosses into the box looking for Rondon, and he had a great chance when he out jumped Azpilicueta at the far post but headed just wide. That was the last real chance of the match, with Chelsea holding on to take the points. The two-match league run with no goals scored at home was ended, but questions still remain about whether Hazard at centre forward is the right option, and how our creativity has waned over the last month. Willian, Hazard, (Giroud 87), Pedro, (Hudson-Odoi 81).